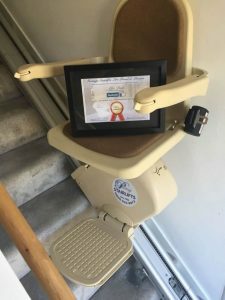 Prestige Stairlifts ran a campaign on Facebook to find someone that would benefit from having a stairlift installed free of charge. Thanks to overwhelming support for a local young man Prestige Stairlifts heard the story about Alfie Peak. Alfie was sadly left brain damaged after a brutal attack in Bexhill on Sea. Alfie, a young father, left hospital for the first time in seven months on his 26th birthday after the savage attack which left a trainer print on his face. Once we heard the story and read all the compelling nominations for Alfie Peak, we had to install a free stairlift to help improve his life. His partner, Tanya White, wrote “I am nominating Alfie Peak! He was sadly attacked in July 2013 and sustained a traumatic brain injury which left him with severe brain damage. Alfie uses a power wheel chair to get around but has never been able to go upstairs in the house and has not ever seen his children’s bedrooms. I know Alfie would greatly benefit from a stairlift”. I think this also shows that stairlifts are not just for the elderly… a common misconception. Posted in Prestige Stairlifts news and events.